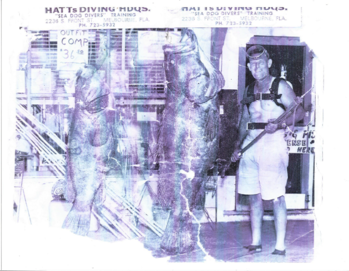 In the early 1940s, Russel Hatt Sr. opened a bait and tackle shop located where what is now an antique shop, next to the railroad tracks, in Historical Downtown Melbourne. When his son Jerry Hatt, a self-taught diver bought an air compressor from a military surplus store in Orlando Florida, he began to fill tanks for his friends. Jerry soon took over a corner of his father's bait and tackle shop and began filling tanks for the public and selling dive equipment. As Jerry got older he married and moved to what is now the Chart House located on the Melbourne Harbor. Jerry operated a bait, tackle and dive shop from 1960-1974. In 1974 they built a brand new dive facility complete with dive training pool at our current location. From the first bait and tackle shop to the current dive shop all the Hatt businesses have been within 1 block of one another. Current owner Michael Hatt, son of Jerry Hatt, can honestly say he has grown up in the dive business. From the day he was born Michael lived on the second story of the bait and tackle dive shop. As a toddler to current day diving has been a prominent part of Michael's life. Michael married Starr Hatt and they are currently operating the store with their children. Their four children, fourth generation scuba divers, Crystal, Joshua, Kendra, and Jarod Hatt play an important role in the dive business. Joshua, Kendra & Jarod have made it thier full time job working and helping out around the dive shop. To us diving is not just a recreational sport, but a way of life.